I will confess that half of the appeal of bubble dough – at least for me – was the name. The name just inspired visions of fun and whimsy, so I knew I wanted to try it out as part of our sensory play. 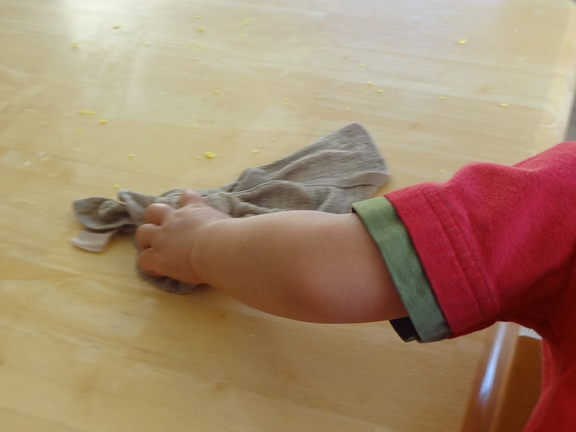 Plus the appeal of something easy to make and easy to clean was just too good to pass up. The end result was beautiful to look at and delightfully silky to play with. 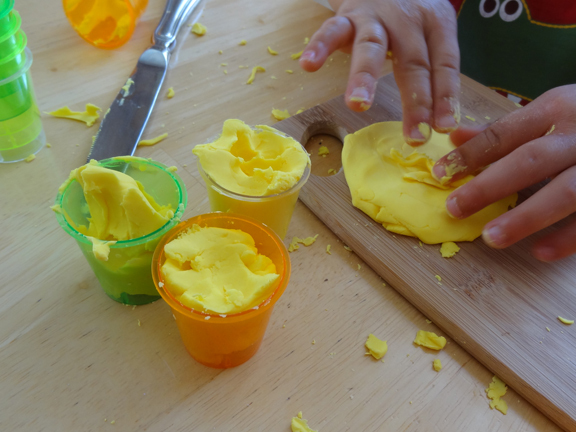 I provided the kids with some kitchen-themed tools to use while playing with the bubble dough. The dough was easy to mold and easy to cut. The kids created a veritable feast using the bubble dough. 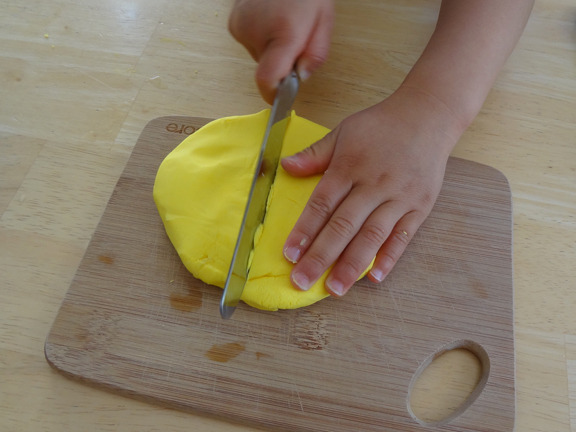 I love how my kids will play for hours if I just give them a few props to use with the dough! 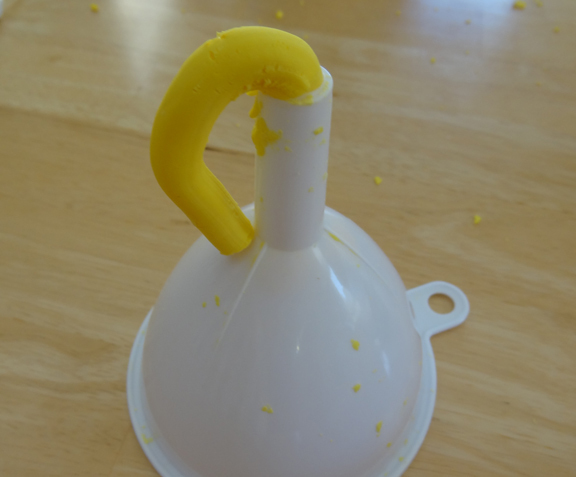 QBoy experimented with pushing the bubble dough through a funnel, and created this fun bubble dough snake. 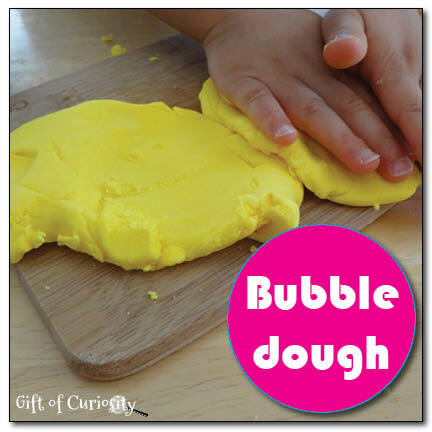 As the kids played, the bubble dough got drier and began to crumble a bit. I have found that to happen with virtually all of our recipes that use corn starch. Fortunately, because bubble dough is made of dish washing soap, clean up was a breeze. 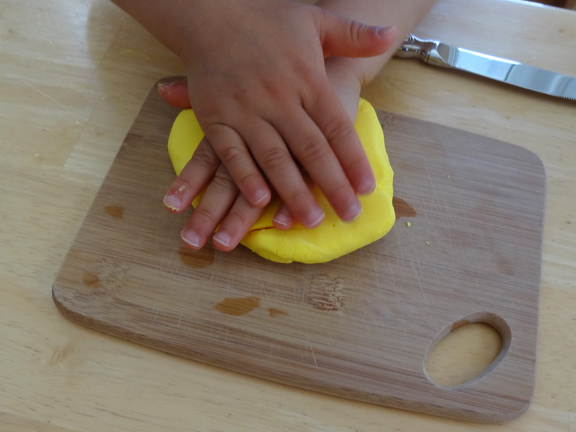 The kids used a wet rag to clean up, and as the bubble dough got wet it turned quite soapy! Looks like fun! How does this compare in texture to Playdoh? It actually compares quite nicely to playdoh! It was very moldable, but I did notice that over time it became more dry so adding more soap would have helped. Hello, I have never heard of bubble dough before. I really need to try this. I think my little boy would like that! I am coming by from We Made it Wednesday. I am one of your newest followers on twitter, facebook & pinterest. Thanks for linking up this sensory fun at After School! This looks like so much fun! 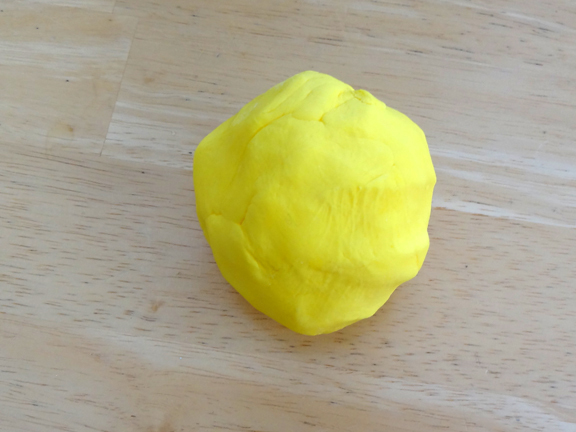 It looks like the perfect playdough substitute when I want playdough fast. What a great idea to use liquid watercolor as coloring. That dough is so bright! Thanks! I just did this with my 5 year old (while her older brothers were doing school), and it was great! It was a fun new texture, and I like that it uses ingredients I always have.